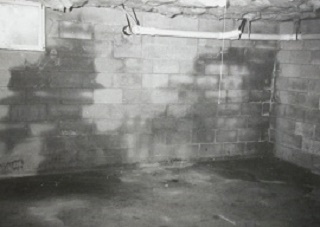 Discovering you have a wet basement or crawl space is never a good thing. Whether is just musty or you have actual standing water, your home or business structure is in danger, as is your family’s health. There are many causes for a wet basement, so it’s important that you contact the experts at Iowa Home Restoration & Repair, LLC first. 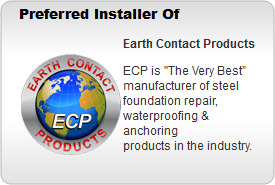 We will come inspect your property for free and work with you to determine the best method to perform repairs. We need to fix the problem first and then make any repairs that are needed. Humidity: Iowa summers can be brutal, with high temperatures, big rainfalls and “corn sweat” adding massive amounts of humidity to the air. 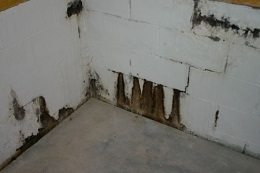 When this air enters the cooler basement or crawl space, it will condense and collect. Rainwater: Rain can enter a basement if downspouts and gutters are not draining correctly. Make sure they are clear and are emptying far enough away from your foundation. It doesn’t take a very large crack in your foundation for water to enter. Even if they are working properly, if we get too much rain, there just isn’t anyplace for it to go, once the soil gets oversaturated. Leaking Plumbing: A broken pipe either inside or outside your home, can cause water to collect to in your basement or crawl space. In addition to causing property and structural damage, you may be paying for water that is going into the ground. The water can enter your home or business due to problems with settling foundations, improperly graded soil or missing or inadequate drainage systems. Iowa Home Restoration and Repair, LLC can determine if any of these problems exist on your property and will let you know what you can do to fix them. Obviously, stepping into your basement and having a wet sock is a pretty good sign that you have a water problem. But there are other things you can look for. If you see any of these signs, give our water control professionals a call and let us help you dry up your basement or crawl space. Some of these may seem minor, but there can be real problems going on “behind the scenes”, so it’s important to have someone take a look at it. The longer you wait to repair a problem, the more time and money it will take to fix and it may cause a chain of other problems. Contact Iowa Home Restoration and Repair, LLC today and let us give you a free inspection and quote to dry up your wet basement or crawl space.